at the gate called beautiful: tomatoes! fyi... any apparent lack of continuity is due to being a mother of 4 boys who apparently do not know what it means to give mama a couple consecutive minutes to blog and keep the same train of thought. one of the things that has keep me occupied this summer has been my garden. (as if being pregnant and then having a baby doesn't keep one busy enough) i have had such a high learning curve, but i have learned so much and been blessed to get both great experience and great reward in food for the dinner table from this new venture of mine. i think i am hooked for life! i thought i enjoyed flowers, but do i ever enjoy the type of gardening i can eat. these are the gems i mostly got into gardening for... tomatoes! 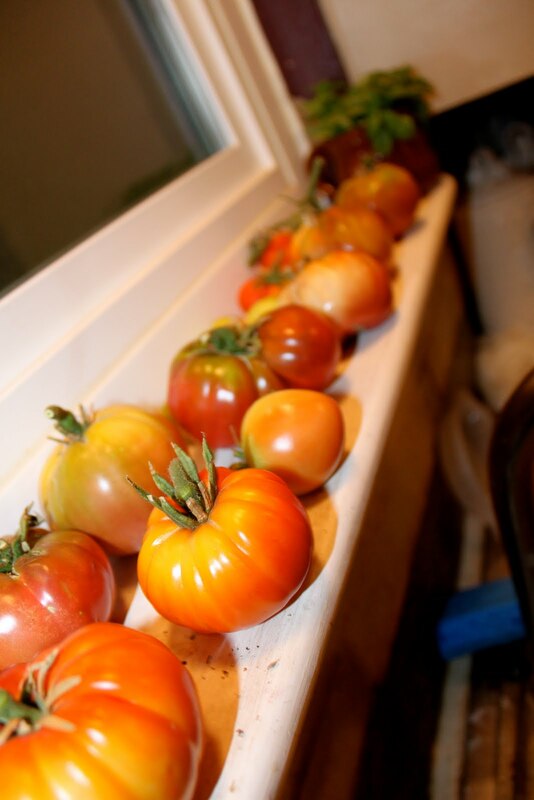 i love the other vegetables and herbs i have had the opportunity to grow, but when i think of a summer garden the first thing to make my mouth water is the thought of a sweet juicy tomato. don't you think these look pretty good for being my first try at tomatoes? i am impressed myself... i think their beauty is half the work of God and half due to the gorgeous heirloom varieties my friend john gave me as small plants to start my first garden. gardening this summer has made me think a lot about God and how He created the very first garden. i have thought about what it must have been like for adam to tend the garden of eden (genesis 2:15). can you imagine what it would be like to tend to the plants of the earth without the nuisance of pests eating the plants or the fruit? in eden, the soil would be the perfect balance with no lack. it wouldn't need any fertilizer. there would be no blossom end rot on the tomatoes because of lack of calcium in the soil because the soil would have plenty of calcium. the sun would be just the right heat and there would be plenty of shade from the foliage, so nothing would be scorched by the sun. there would be no weeds! can you even imagine no weeds?! there wouldn't be rain nor the need of watering with overprocessed tap water... but water would come from the river in the garden making the ideal growing conditions. there would be an abundance of bees to pollinate the flowers to produce the most fruit. the fruit would be huge and in abundance (not to mention completely organic)! oh, how i would love to garden there!! man was always meant to garden (work), but it wasn't always meant to be difficult with the disappointments that can often come with it. i know i have had my own share of disappointments this year in my first attempt at vegetable gardening. i planted twenty pepper plants, both hot and sweet peppers, only to end up with two that barely survived the cutworms, the strange weather this year, and have yet to even be fruitful at all. bummer. i was excited to pick my carrots, as i was told that carrots were easy to grow as a beginner. my carrots were puny! i wish i had a picture to show how skinny and short they were. they weren't even big enough to eat as baby carrots. bummer. we have a hope, however, that our work won't always be a mix of reward and toil. Jesus promised that when He returned to the planet to set up His eternal kingdom that He would make all things new. (revelation 21:5) in romans 8, paul says that all creation groans and waits to be set free from the corruption and curse it was put under. there will be a day when the Son of Man is ruling on the earth and we will see with our own eyes the fruitfulness of the original garden. we were created to work, but not originally meant for the toil and disappointment. in that day we will get all the rewards of our gardening without any of the disappointments that sin brought upon the ground. and we will get a bountiful harvest of tomatoes.